Joe Who? Joe Pass. Not a difficult question, given that it's Pass' image that dominates the front cover of For Joe. A quick glance at the track listing makes it pretty clear too. Then there's the rhythm section of Jim Hughart on bass, Colin Bailey on drums and John Pisano on second guitar: men whose working relationship with Pass goes back to the mid-60sall three performed on For Django (Pacific, 1964). Band leader and primary guitarist Frank Potenza has certainly chosen a superb set of tunes and surrounded himself with a stylish trio of players to perform them. The result is quite delightful. Potenza was Pass' friend for 20 years, from their first meeting in 1974. In his sleeve notes he writes about that friendship and about his long-standing plans to record a tribute album: plans that finally came to fruition in September 2012. The tribute is clearly heartfelt and the resultsencompassing standards like Earl Hines' "Rosetta" and George Gershwin's "Love Is Here To Stay" as well as three of Pass' own compositionsshowcase an impressive range of tempos, moods and melodies. The laidback groove of Pass' "A Foxy Chick And A Cool Cat" forms an impressive openerwith Hughart's slinky bass line to the fore thanks to the album's excellent sound. The album's only original composition, Pisano's playful, waltz-time "Blues For Joe," features its composer on lead guitar. For Joe is also a welcome reminder of the influence of Django Reinhardt, another giant of the guitar. Pass' "For Django," given a bossa nova arrangement by Potenza, and the rhumba rhythm of Reinhardt's "Fleur D'Ennui" both demonstrate the quartet's imagination as well as its instrumental ability. For Joe is intended as a lovingly-crafted tribute to one particular musician. It actually goes beyond that, standing as a tribute not only to Pass but to a fluid, melodic and organic approach to the instrument that communicates with an audience without the enhancement (or encumbrance) of effects pedals and mega-volume. No-one here needs to turn their amps up to anywhere near 11. Track Listing: A Foxy Chick And A Cool Cat; For Django; Blues For Joe; Catch Me; Do Nothin' Til You Hear From Me; Fleur D'Ennui; Love Is Here To Stay; Rosetta; Voce; Beautiful Love. 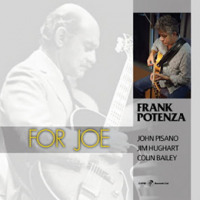 Personnel: Frank Potenza: guitar; John Pisano: guitar; Jim Hughart: double bass; Colin Bailey: drums.